Rent Hilton Santa Clara | Corporate Events | Wedding Locations, Event Spaces and Party Venues. From award winning dining to spacious rooms and suites, the hotel offers a modern touch and convenient location. This stylish and sophisticated California hotel boasts an ideal location adjacent to California’s Great America theme park and directly across from the Santa Clara Convention Center. This AAA 4-diamond hotel in Santa Clara, CA is set in an attractive resort-style building, just 20 minutes from the San Jose International Airport (SJC), in the heart of Silicon Valley. We are also within a five-minute walk of Levi's Stadium – home of the San Francisco 49ers. Conveniently located in Silicon Valley, Hilton Santa Clara features several meeting space options equipped with updated technology. Host an intimate gathering in our Yosemite room for up to 50 people, or organize a business seminar in one of the Coastal rooms. 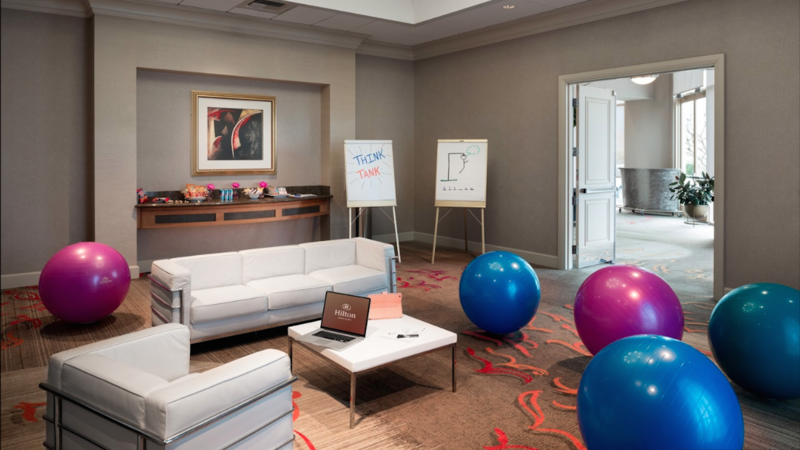 For meetings of up to 25 people, Hilton Santa Clara offers simple, bundled meeting packages, which provide the amenities needed to make every meeting a success. With over 7,000 sq. ft. in multi-functional meeting space, our hotel in Santa Clara offers unique event space configurations to cater to any sized gathering. Located adjacent to the Santa Clara Convention Center and four miles from the San Jose Airport, our Santa Clara, CA hotel boasts an ideal location that is convenient for attending Guests. Our event planning Team Members are dedicated to providing personalized services to ensure all of the details are taken care of. Our hotel turns wedding dreams into reality. From our stunning ballrooms for wedding receptions to our award-winning La Fontana restaurant for rehearsal dinners, the options are endless at this Santa Clara wedding venue. Let this Hilton hotel's award-winning chef and talented catering Team Members craft a sumptuous reception meal. Choose from action stations, plated dinners, or buffets. Contact us today to inquire about our various wedding packages.